So I am a bit of a slacker this week. We had this crazy All-Day Bus-Stop Bar-Hop event this past weekend that completely destroyed me. We went hard. Needless to say I was a bit “under the weather” on Sunday so I didn’t get a chance to do a review. That being said, I dug through some of my Quick Draw notes to bring you a quick look at a cigar that I’ve personally smoked the hell out of. Quesada’s Jalapa. 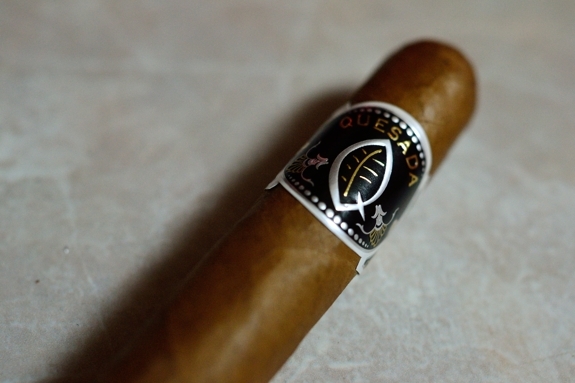 Quesada’s Jalapa is the follow-up release to their incredibly successful Seleccion Espana line. The Seleccion Espana was a blend released in Europe which catered to their more common, Cubanesque flavor profiles. Well, some of these cigars managed to find their way into the hands of people here in the states and the buzz about this blend blew up. I personally smoked my fair share of them. Quesada had to react. Since the Espana was a European release Quesada then took the blend, and basically took the blend and swapped the wrapper, and then released it into the US. The Espana carries a very rare, very pricey Ecuadorian Arapiraca wrapper making the price of the stick much higher. This is fine in the Cuban-filled European markets, but the US needed something that would drop the price down while maintaining or enhancing the cigar’s flavor. What they came up with was a Nicaraguan Jalapa wrapper which the US is much more familiar with. This limited edition cigar comes in 3 sizes: Robusto (4 7/8 x 50), Belicoso (6 1/8 x 52) and Prominente (7 5/8 x 49). They are packaged in boxes of 10 and limited to only 1,000 boxes of each format. Although this cigar was released last year in August they can still be easily found on a lot of shelves across the states for between $8 – $9.50. The blend starts out with a Nicaraguan Jalapa wrapper, Dominican Binder, and Nicaraguan and Dominican Fillers. Considering that we are dealing with Quesada and the MATASA factory, it goes without saying that this cigar carries top notch construction. The wrapper starts out with perfectly consistent, with a honey-brown color that really showcases all the oils the Jalapa carries. The slender body is polished of with a beautiful, round triple cap. 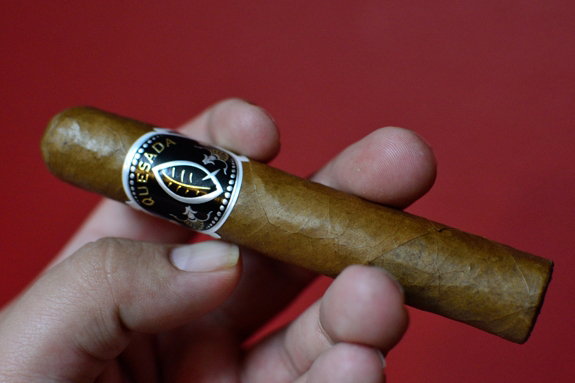 Seriously, you can rub the oils from this cigar off on your finger tips. Although the wrapper feels a bit fragile the cigar didn’t give much as I squeezed it between my fingers. Right off the bat I am greeted with lots of sweetness and some strong black pepper. The pepper faded right away and then left me with a very smooth, very creamy cedar, sweet, earthy tobacco flavor. One thing I enjoyed about the Espana was how remarkably smooth the experience was and the Jalapa mimics that experience every step of the way. As the cigar progressed notes of cashew and even some really soft mint came and went while the finish was just as smooth and creamy as the start. I never had any issues with the burn on any of the Jalapas I have smoked. In fact, the ash and burnline have been some of the best I have seen in recent cigars. It took me a little over an hour each time to take down the Robusto format and about an hour and half on the Belicoso. Needless to say I enjoyed every minute of it. The Jalapa left me with no nicotine kick or harshness. I have smoked about 10 of the Robusto and a handful of the Belicoso. Although I have never smoked the Prominente, I would have to say the Belicoso was my favorite from the two I had smoked. It produced a smoother experience with, what I felt was more cedar character. So is the Jalapa a good replacement for the Espana? In a value and market sense, totally. Is it better than the Espana? In my opinion it is not. I absolutely LOVE the Espana, but that doesn’t mean it’s not a good cigar. In fact, It’s a GREAT cigar. And for the price point I think that this stick, despite it’s availability should find it’s way in anyone’s humidor. It’s light, balanced, and smooth while it carries a lot of bold flavor that will appease any palate. LOL, I’m getting tired of complaining that I can’t get a hold of any Quesadas where I am. I’ve been curious as to the difference between the Espania and Jalapa. Thanks man, and didn’t you mean “under the table” as opposed to “under the weather”? Nice review and timely for me as I just picked up two of these and I was wondering if they were as good as they look. Now, I want to put my mitts on the Espania version. You won’t be dissappointed man. The only time I have seen the Espana lately is in that Quesada sampler pack with the unbanded sticks. I think Smoke Inn just got them back in stock.